This guide has been developed to help nonprofits who are new to writing annual reports to easily get the process started while staying transparent. If properly done, annual reports are an important tool for keeping stakeholders informed about your activities and to keep them engaged. Developed based on our experience at the Nigeria Network of NGOs, this guide offers information on how to plan and create valuable engaging annual report that you can submit to regulators and one that your friends, donors, beneficiaries and other stakeholders would want to read. Two hundred and nineteen Nigerian NGOs, nonprofits, and charities participated in the survey for the 2018 Global NGO Technology Report. Their responses are summarized below. The data is meant to provide benchmarks for organizations in Nigeria so that they can gauge whether they are ahead or behind in their use technology. ★ 71% of NGOs in Nigeria have a website. Of those, 90% are mobile compatible. ★ 76% use the .ORG domain. 11% use .COM. 3% use .NET. 3% use .NGO. 1% use country codes. 6% use other domains. ★ 38% use WordPress as their Content Management System for their website. 4%use Joomla. 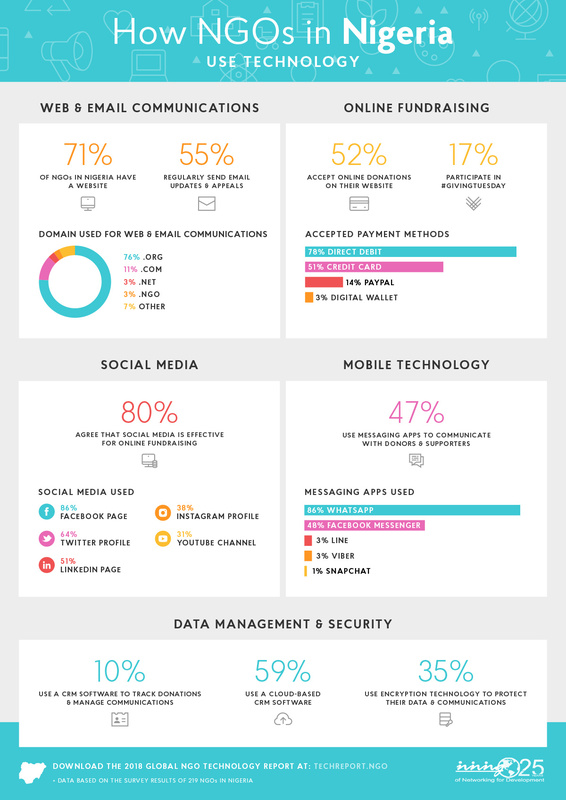 16% use another CMS and 42% don’t know. ★52% of NGOs in Nigeria accept online donations on their website. Of those, 78% accept direct debit payments. 51% accept credit card payments. 14% accept PayPal. 3% accept digital wallet payments. ★ 30% utilize an online peer-to-peer fundraising service. ★ 17% participate in #GivingTuesday. ★ 55% of NGOs in Nigeria regularly send email updates and fundraising appeals to supporters and donors. Of those, 48% use an email marketing service. 18% send email via BCC. 4% send email via their CRM. 20% send email through another method and 10% don’t know. ★ 58% regularly send text messages to supporters and donors. Of those, 42% also utilize a text-to-give service for SMS fundraising. ★ 86% of NGOs in Nigeria have a Facebook Page and 28% have a Facebook Group. 64% have a Twitter Profile. 51% have a LinkedIn Page and 16% have a LinkedIn Group. 38% have an Instagram Profile. Other social media used are: 31% YouTube, 24% Google+, 5% Pinterest, 2% Vimeo, 1% Flickr, 1% Tumblr, and 1% Reddit. ★47% use messaging apps to communicate with supporters and donors. Of those, 86% use WhatsApp. 48% use Facebook Messenger. 3% use Viber. 3% use Viber. 1% use Snapchat. 1% use WeChat. ★ 85% of NGOs in Nigeria use Microsoft Windows as their operating system on desktop and laptop computers. 9% use Google Chrome OS. 2% use Apple macOS. 1% use Linux OS. 1% use another operating system and 2% don’t know. ★70% use Google Android as their operating system on smartphones and tablets. 19% use Windows Phone. 4% use Apple iOS. 1% use another operating system and 6% don’t know. ★ 10% use a Customer Relationship Manager (CRM) software to track donations and manage communications with supporters and donors. Of those, 59% use a cloud-based CRM. ★ 35% use encryption technology to protect data and communications. Of those, 24% to protect the privacy of email communications. 20% to protect organization information. 12% to protect donor information. 12% to protect the privacy of mobile communications. Date for public hearing on the NGO Bill now fixed. Let’s hit the House Committee on CSOs with our memo and also be present physically to kill Bill HB585 finally. Concerned about the restrictive nature of the NGO Regulatory Agency Bill, 123 nonprofit leaders on Tuesday 12 September struck back against the proposed Bill arguing that it is not ‘’fit for purpose’’ and should be ‘’killed”. Through a declaration issued at the end of a one-day national dialogue to discuss the Bill and its implications for civic space in Nigeria, participants expressed their concern noting that the Bill if passed will make Nigeria backslide on its international commitments to standards, norms and principles on freedom of association and assembly. “We are extremely concerned that there is a NGO Regulatory Agency Bill (HB58) seeking to regulate the nonprofit sector. Nigeria as a signatory to many international standards, norms and principles around freedom of association and assembly cannot be seen to be backsliding on its commitments to the rights of citizens and citizen organisations”. A copy of the Declaration issued at the end of the event can be downloaded here.